In 2002, Juan Carlos Cancino, was riding his bike around town and found an entire city block of dilapidated greenhouses, near a hill in the Portola called University Mound. He called his friend David Gabriner, and suggested he come take a look. “We showed up and kind of fell in love – not with each other but with the greenhouse – and started daydreaming about what this space could be,” says Gabriner. So they made their love official, by founding The Greenhouse Project. 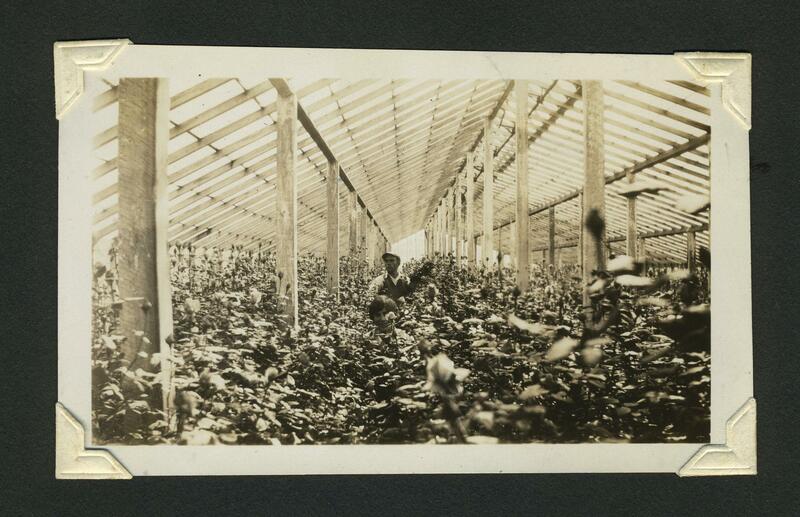 Before they could do anything with the greenhouses, they needed to find out who had abandoned them. That set them on an investigation into the history of bay area floraculture. Credit Courtesy of Gerald Garibaldi and David Gabriner. The greenhouses were built in the 1920s, when the rolling hills of the Portola were home to the city’s flower growing district. The warm climate and undeveloped land made this an ideal place for recent immigrants from Italy and Malta to set up business. And Cancino says, those businesses thrived. Cancino and Gabriner knew a piece of land like this was rare -- a quiet place in a big city. They had zero experience with urban agriculture and knew nothing about greenhouses, but they had a lot of energy, and they were obsessed. What they were trying to do seemed impossible. The rose farm was a mystery, and it didn’t help that they were a couple of outsiders, with no real leads on who even owned the property. That is, until, on a scrap of paper hidden among broken glass and dead leaves, they found the name Garibaldi. Then decided to call every person by the name of Garibaldi in the phone book. And after eighteen dead ends, they struck gold. Inside his immaculate home of Holyoke street, Gerald Garibaldi rolls out a photograph that covers most of the kitchen table. He took it himself, age 23, from the top of McLaren Park. The grainy black and white image shows the pitched white-washed greenhouses, and lush fields of the surrounding streets. His entire family was raised within a few blocks and his memories of the neighborhood are sharp as tacks. Garibaldi worked in the greenhouses on and off as a child, and after his father died, full time. “Your fingers would look like pin cushions, you know!” says Garibaldi. His family eventually sold their share in the business and that’s where his nostalgia seems to end. “All I hear about it every time when somebody says to me: ‘What they going to do with the greenhouses?’ I tell them, ‘It doesn’t matter to me I have nothing to do with it anymore,’” Garibaldi says. Cancino and Gabriner wanted to know who did. Digging through old documents, they learned the land was put into a trust. They even tracked down the trustee, an elderly relative of the Garibaldi family. They arranged a meeting. But, she died. The next day. The rest of the family weren’t willing to talk. Cancino and Gabriner felt like the only people left who cared about the greenhouses. They thought that if they could get the community on their side, the greenhouses might stand a chance. Maybe they could find a way to purchase the land, get help from the city, maybe someone out there knew who to talk to. “We assembled what we say as the leader core of the portola and the four of us sat there and pitched them,” says Gabriner. Ruth Wallace was at that meeting. Wallace has lived in the neighborhood for 12 years. She runs public greening projects and the Portola garden tour. She’s kind of like the Queen of gardens here. And she has the throne to prove it. Her own yard has two six-foot-tall lifeguard chairs that look out over the backyards of the Portola, and the greenhouses. Wallace would like to see the greenhouses restored. “I think it would be a shame because it's the last remaining – it doesn't matter what it is – the last remaining of anything and to think that it could just be erased,” says Wallace. It took ten years of dreaming and digging, but Cancino and Gabriner finally felt like the project was getting somewhere. But then, after decades of disuse, in October of 2013, the greenhouse property was listed for sale – for $12 million. At first it looked like the property was going to sell to housing developers. But it turns out, The San Francisco Public Utilities Commission, the PUC, was interested in some land nearby. They wanted to restore an underground creek that runs under the greenhouses. The PUC offered a tour of the proposed creek path to gather community input. Cancino and Gabriner were on that tour, along with 35 other residents. The Greenhouse Project are talking with the PUC about co-purchasing the land and saving the greenhouse land for community use. To do this, they’ll have to raise several million dollars. And the deal’s not final -- the property could sell tomorrow to somebody else. But if everything goes according to plan, their visions could be taking shape as early as 2016. The Greenhouse Project became about much more than a secret hideaway, or the nostalgia and charm of dilapidated beauty. David Gabriner and Juan Carlos Cancino’s love affair with the greenhouses turned into a marriage, to an entire neighborhood.